Manifest. 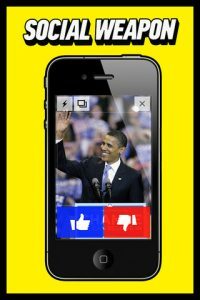 is a free social networking iPhone app, developed by REDMADROBOT. If you’re young and crave a social network with a strong philosophical core, this is the app for you. “We don’t want politicians to speak for us. 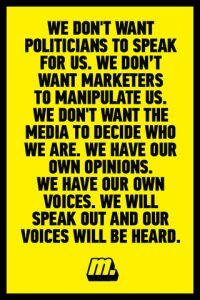 We don’t want marketers to manipulate us. We don’t want the media to decide who we are. We have our own opinions. We have our own voices. We will speak out and our voices will be heard.” This is the promise of Manifest. Manifest users can log in by creating a new account, or by using their Facebook or Twitter login data. The look of the app is bold, graphic, and fresh. Manifest. 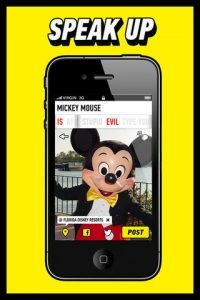 is a self-proclaimed “social weapon” that allows everyone to speak up about everything happening around. You can weigh in simply on topics like politics, corporate culture, brands, celebrities, and more. Simply take a photo with one of two buttons (one for a positive attitude toward theobject and another for negative), tag the object in the photo, choose how to describe it – “cool, awesome,fantastic etc.” or “dumb, stupid, lame etc.” and share it. Photos are automatically turned into “posters” whenthey are shared across social media channels. “Manifest is not about sharing photos, it’s about reacting to the world. Manifest. is a direct channel for people to speak, and nobody falsifies their voices. That’s why Manifest is a social weapon,” Manifest. co-founder Vitaliy Smorodin explained to users in a press release. 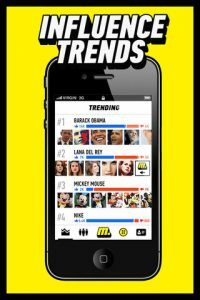 If you want a simple way to state your opinion about trending news topics and other popular issues, Manifest. 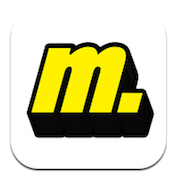 is a great tool to have in your app arsenal. Manifest.is compatible with iPhone, iPod touch (4th generation), iPod touch (5th generation), iPad 2 Wi-Fi, iPad 2 Wi-Fi + 3G, iPad (3rd generation), iPad Wi-Fi + 4G, iPad (4th generation), iPad Wi-Fi + Cellular (4th generation), iPad mini and iPad mini Wi-Fi + Cellular. Requires iOS 4.3 or later.